Learn more about Mary Whyte’s full-length DVD. I'm a reader and studier by nature, but the lessons and techniques that I learn from books and magazines always seem to click much quicker when I watch an artist paint, rather than try to puzzle everything out on my own. For example, I’m just starting to understand watercolor painting—what it can do as a medium and how you can manipulate it. I’ve read a lot and seen amazing artworks, but watching Mary Whyte create a watercolor painting in her DVD, Mastering Watercolor Portraiture, was so helpful for me. I came away with a better understanding of how a professional watercolor artist approaches the medium, making a lot of connections based on her watercolor painting instruction on color mixing, what level of detail is best suited to the medium, and how to work around a composition. I want to share this clip from Mastering Watercolor Portraiture with Mary Whyte because it marked a bit of a turning point in my watercolor education (not to sound cheesy!). In the clip, Mary discusses how reflected light from the model’s face warms the color of his shirt on one side while leaving the other in cool shadow. She goes on to show how she paints each side of the collar accordingly using the basic color complements of red and green. She breaks down this fairly complex task into logical, practical steps that make sense. If I had been by myself in the studio, I probably would have gone about the task in a totally different way. Watching Mary paint allowed me to skip a lot of guesswork and gives me the opportunity to integrate her knowledge of watercolor into my own practice. Mary Whyte is an exceptional painter and instructor—a truly rare combination. Learning from her in Mastering Watercolor Portraiture will allow you to understand how to mix colors for skin tones, what brush techniques will create a believable sense of texture on paper, and why watercolor artists sometimes work upright. Her insights into watercolor art will give you an edge in your own process and show you how a professional painter creates a memorable portrait from start to finish. Enjoy! You have to know where the lines are before you can color outside of them. Now you can learn all the must-knows of watercolor with the exciting new DVD Mastering Watercolor Portraiture with Mary Whyte. Join well-known artist Mary Whyte for a full hour of step-by-step watercolor technique and a start-to-finish head study. Follow along as she shows how to transform your blank canvas into a character's story. Discover how to capture the emotion and character of your model with the right light-to-dark transitions. Make the paint’s movement work for you with tips to reduce backwash, soften edges, and more. Add more life to your portrait with Mary’s trick to making a form come forward with increased intensity and contrast. Create at your own pace: start and stop the lesson when it's convenient for you. Do more than paint a portrait: tell your subject's story with this watercolor lesson. 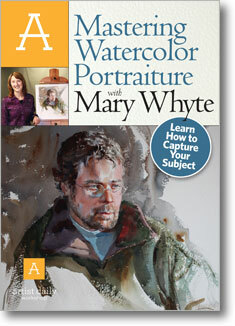 Order your copy of Mastering Watercolor Portraiture with Mary Whyte today! Get started with this easy-to-follow watercolor resource you'll use again and again. Oh!! Score!! So wonderful you got a video from such a great artist. Love her work.